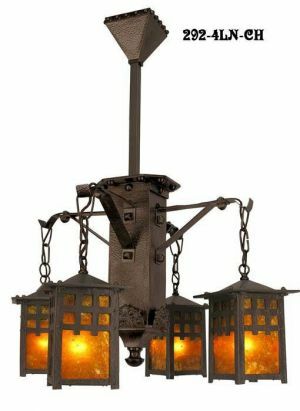 Matching single pendant to the lovely cast Craftsman lantern chandelier fixture. This pendant is also heavily cast, not inexpensive sheet metal. 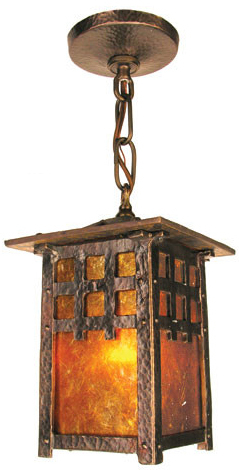 The lantern is cast brass and then patinated to a nice Arts and Crafts hue. 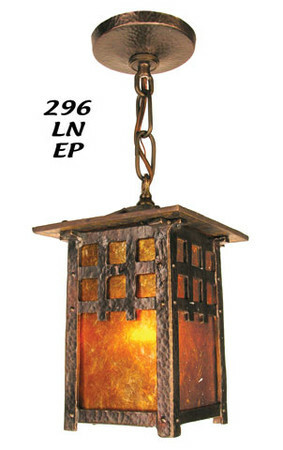 Picture several of these to light a long hallway in a turn of the century wood-paneled Arts & Crafts home. Mica windows add to the ambiance and originality. Rayon covered UL approved wire is used for an authentic reproduction. 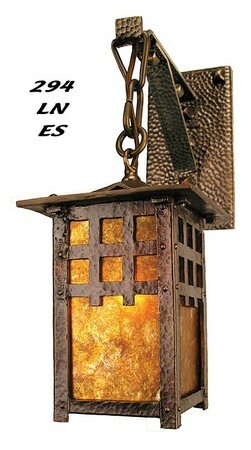 Height: 30" overall supplied height, measured from the top of the canopy to the bottom of the lantern. The fixture in our picture has been shortened to 15" using only two chain links instead of the 12 it normally comes with. Let us know your desired height so we can shorten it to your project specifications. Width: 5 5⁄8" overall, measured at the top of the lantern. Lantern measures 4" x 4" x 8" tall. Wattage: Single socket, UL Rated for a 100 watt bulb. wall sconce and 4-light chandelier in the Morgan lantern style.